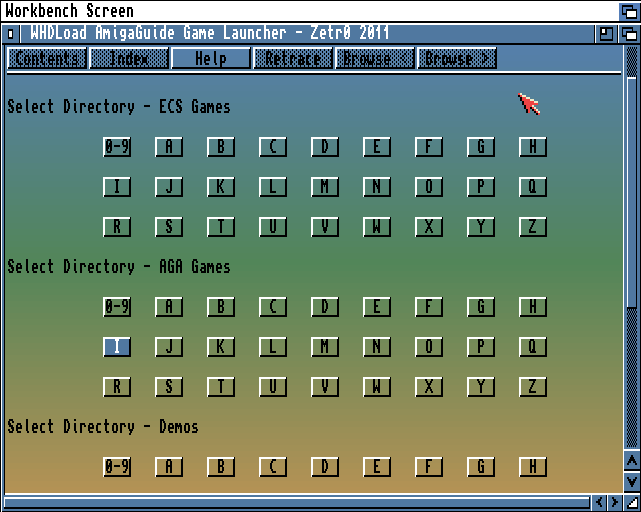 There are few GUI launchers for WHDLoad games, I guess there are more but I’ve tried only iGame, X-bEnCh and AGLaunch. They all work fine, but somehow I like AGLaunch the most. It’s lightweight and fast. Sure, it doesn’t have game screenshots, descriptions and flashy interface, but that’s why it’s fast. If you don’t have accelerated Amiga it might take a bit to start the game with first two, but with AGLaunch it’s just few clicks away. Another reason why I got used to it is that it comes with Classic Workbench pack out of the box so it’s always at hand. Another reason why it’s fast is that it uses Amiga guide system, format that most of Amiga documentation is written in, it actually displays prepared guide files with game lists so it’s kinda native to the system. And that’s its biggest drawback, it doesn’t have any system to update these guides except manual edit. Which is OK for few files, but if you have few hundreds, or even thousands of games… let’s just say it gets boring, really fast. Even if game pack author makes these updated files, like Turran does over on EAB, you might wan’t to make your own custom lists. For this reason I’ve made this tool. 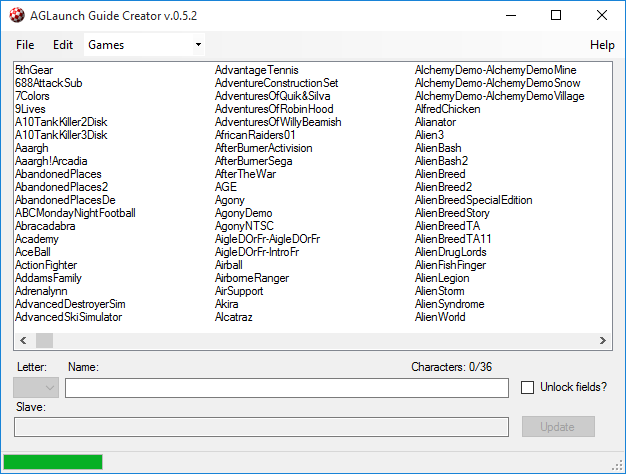 It consist of two parts, one is run on amiga to create plain text list of WHDLoad games, and windows application that loads this text file and creates guide files that AGLaunch uses. When you load list(s) you can edit name of every entry, save current list to XML, load it later, and of course generate AGLaunch guide files. It supports up to three separate, one for ECS/OCS games, one for AGA and one for Demos. I’ve also included manual with the app with detailed instructions and explanations. This is how AGLaunch looks like with all three separate lists. Posted on August 31, 2015, in Amiga, Retro computing and tagged AGLaunch, WHDLoad. Bookmark the permalink. 4 Comments. The file is not available anymore? I updated the link. Few months back dropbox removed public files system so old links stopped working. Just tried out your tool and it works great. I’ve created games and demos but in the demos lists the names are not separated by columns, they just appear glued to each other. What can i do to make them appear the same way as games do?